Traditionally used in Indian cuisine, Ghee/Clarified Butter has been given the cherished title of "Rasayana" in Ayurveda ~ foods that help overall health, longevity and well-being. Ghee/Clarified Butter balances both Vata and Pitta. In the old days, fresh whole milk was churned very slowly for the butter to form and separate from the milk. 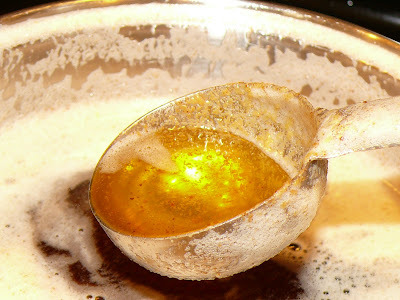 The accumulated butter was then melted to make a very aromatic liquid mass of rich, golden ghee. Most modern dairies, even many “organic” ones, no longer churn their cream to make butter. These days typically Neyyi/Ghee is store bought but the homemade Ghee is very aromatic and delicious when compared to the store bought ones. 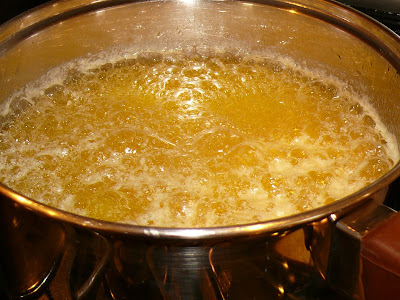 I always prepare Ghee/Clarified Butter at home for added flavor and freshness. In a heavy bottomed vessel, melt 1 pound unsalted butter over low heat; this should take about 15 minutes. Increase the heat to medium. White foam will begin to form on the surface and the butter will start to crackle.This indicates that the moisture is beginning to leave the milk solids. Leave it on for 10 minutes without stirring. When the moisture is completely gone, the crackling will stop and the foam will subside. Using a wooden spatula, stir the liquid constantly until it begins to get to a golden brown in the picture shown. Immediately turn off the heat and let the brown residue settle to the bottom. 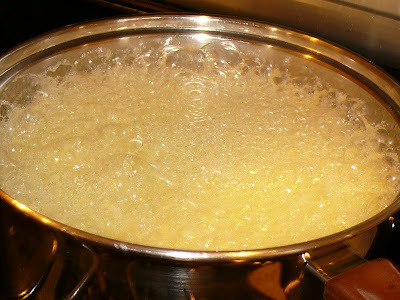 When the melted butter is cool, pour the clear liquid into a jar through a double layer of cheesecloth or a fine seive. One pound of unsalted butter will yield 1 1/2 cups of ghee. 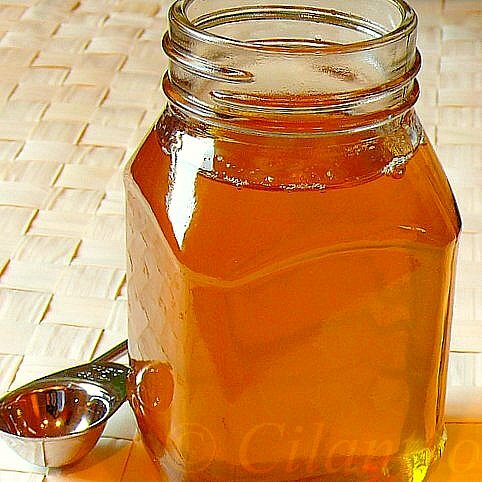 Ghee will keep in a well-sealed jar for about 2 months at room temperature and 5 months in the refrigerator. Add a few drumstick leaves OR curry leaves dipped in buttermilk just before removing from the heat for added flavor. If you cook the Ghee too little, you will be left with moisture in the Ghee and it will lack the taste and qualities also, it will tend to spoil. If you cook it too much, it will burn and impart a certain flavor to the Ghee. i miss my aaji's elaborate ghee-making ritual.. I made ghee at home for 1-2 times when I was not working.. now the process of saving the cream and all seems too tedious! It has a beautiful color! My mom use to make clarified butter for my dad to eat with seafood. I don't dip my drumstick leaves in buttermilk! Love the last pict! Ghee looks so good. Nice post. Lovely golden color. As Cham said, i use drumstick leaves but not dipped in buttermilk. One of friend uses curry leaves dipped in buttermilk. Lovely last click...Do the same too when i need for home made ghee..
Ghee looks perfect. Amazing color. I too make ghee at home,i never buy ghee as we dont like the smell of the store bought one,this home made ghee is sure different and more flavorful! I never use ghee at home, but latley i have been seeing so much delicious recipie with ghee that i am tempted to make at home. Nice snaps and step by step explanation is good. Back home they always add drumstick leaves while making the ghee and filter it out.